Lots of people come from nearby Mexico City and Toluca to enjoy a day in Valle de Bravo. Sunday lunch at the market. Paco and Oti both had menudo. But we're sticking with quesadillas stuffed with chicken and/or mushrooms. Oh, and a huge glass of fresh orange juice between the two of us! We each went our separate ways for 45 minutes and agreed to meet at the church. We wanted to buy our weekly fruits and veggies, plus we had been invited to little Fatima's 3rd birthday party yesterday afternoon and we needed to buy a present. Our own granddaughter Sadie had been given a princess play costume for Christmas, and she looked really cute in it, so we wanted to get something similar for Fatima. So we did some shopping around and we were lucky to come across a pretty dress in a used clothing store. Then, we found a small crown in another store, and the costue came together! 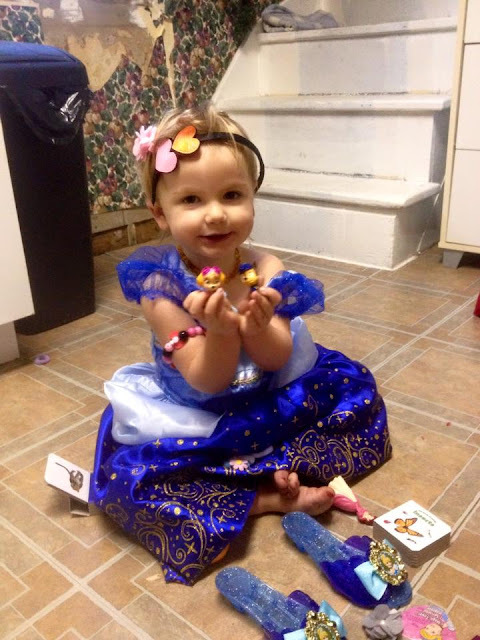 Granddaughter Sadie in her princess costume. The dress we found for Fatima. Then we wandered around the market. Here's a colorful dining set! Look at this tiny pup! Oti, with the camote guy. You can buy all kinds of interesting things at the Sunday market. Candied camote. Camote is a type of wild potato, and the other is a type of sweet potato. Later in the afternoon it was time to go to the birthday party. Little Fatima was a kind of surprise around here when she arrived three years ago. Chago and Carmen already had two children 10 and 12 when Fatima was born. And with her princess costume that we gave her. She sure is a cutie! Lotsa fun you party animals enjoying the locals. Heartwarming photos! Question for you, the first photo of street, with many white square cloths strung high across the street, reminds me of the Tibet region of China where they're called "prayer flags" and in many colors. What's Mexico's history and culture on these white flags and are they always white? Those flags/banners are actually made from plastic (sorta like plastic bags) but the origins are from a long time ago starting out on bark and then tissue paper was used and may still be in some areas or for some events. And no they aren't always white. Normally they are used for religious festivities such as weddings, quinceañeras, baptisms, and christenings. They are called Papel Picado. Here is more info on them en.wikipedia.org/wiki/Papel_picado". Both little girls are darling in their princess attire... what a fun party! Since we have been there there have been lots of parties, we are going to need to move on soon just to have a break. I was at a Mexican birthday party yesterday too! Check out my FB page at Shirley Stollings Whitelaw. Great princess costume. I do miss the Mexican markets..love the pictures of them though. Yep, we love the markets as well. Love when you mingle with the locals - fun & interesting! Those are two adorable princesses!! Meeting the locals is sometimes the best part of travelling. Are those flour tortillas on your quesadillas? I know you eat gluten-free so was wondering about that. We typically only see small corn tortillas in the places we've been in Mexico, and the larger ones all seem to be flour. I'm with you on the menudo...no thanks! Nope they were corn ones that were being made right there at the stall with the big metal tortilla hand press. For some reason or other it seems that they make all the tortillas a little larger in this area. We have bought a kilo of corn tortillas at two different tortillarias with the big tortilla machines and they are all a little larger than anywhere else in Mexico that we have bought them, not sure why!